What’s the Deal with Moss? You can improve soil drainage with Aerify Plus. Trimming back the lower branches of trees can be helpful. Clay soil/compaction. Grasses are tough plants that can grow in fairly heavy clay top soils, especially if the soil is moist. But extreme compaction or denser clays are almost impregnable. Moss has no problem growing on this dense clay. The best product for improving clay soil and compaction is Aerify Plus. Check out our blog post on How to Water Your Lawn for more tips. Tree Roots. Tree roots can cause moss in a couple of ways. 1. The larger roots that grow close to the soil surface do not give the grass enough soil to dig into. Hence, moss develops and grows on top of these roots. When lawns are not watered deeply, the finer and even microscopic feeder roots of the tree can move upwards into the topsoil and compete with the grass for both water and space. This weakens the grass and permits moss to come in. This also can happen around shrubs that border the lawn, especially evergreens. Check back soon for a blog post on How To Properly Mow Your Lawn! Very Acidic or Very Alkaline Soil. 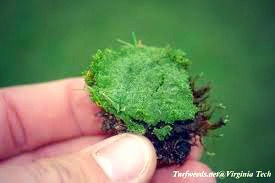 As mentioned above, this is not the major cause of moss on most lawns. In extreme acid or alkaline conditions nutrients will lock up and become unavailable to the grass. 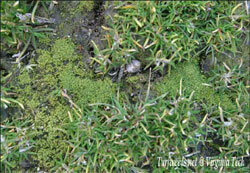 This causes unhealthy grass and allows moss to fill in. If the pH of your lawn is extremely low you can balance it with Liquid Lime. If too high, take a look at our Liquid Sulfur. If you have any other questions about moss, please feel free to drop us a line at info@natureslawn.com! Blog Exclusive: Save 10% on your next purchase with coupon code NLBLG10!